Patello-femoral joint pain is thought to be a major component in over 80% of all knee pain. Patello-femoral joint pain can occur in both children and adults and usually responds extremely well to physiotherapy treatment. Scientific research has confirmed that physiotherapy intervention is the most effective long-term solution for kneecap pain. Approximately 90% of patello-femoral syndrome sufferers will be pain-free within six weeks of starting a physiotherapist guided rehabilitation program. For those who fails to respond, surgery may be required to repair any severely damaged joint surfaces. The patient will usually present with medial knee pain of gradual onset. 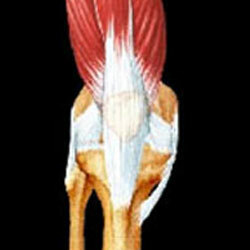 Patello-femoral pain can also refer to the lateral, inferior and posterior knee regions. There will be tenderness of the medial patella facet (underneath the patella), and they will complain of pain with squat, standing up after prolonged sitting, and pain particularly walking up and down stairs. Children may complain of knee pain during or after sport. Often in children there has been a change in activity levels or a growth spurt associated with the increase in knee pain. Usually the vastus medialis oblique muscle (the VMO on the inside of the knee) will be small and weak on the side of the knee pain, and this muscle is responsible for maintaining some medial glide of the patella during functional activities. If the VMO is weak, the patella tracks laterally which can lead to pain, compression and even subluxation/dislocation. The VMO is also inhibited immediately with the onset of knee pain, so patello-femoral joint symptoms can occur some time after an acute knee injury that was initially unrelated to the patello-femoral joint. Treatment of patello-femoral joint pain includes patella taping, appropriate stretches and strengthening exercises to correct lower limb muscle imbalances, orthotics if indicated, and localised patella mobilisations to stretch the tight lateral tissues (including the ITB). This treatment approach is often referred to as the McConnell’s treatment regime. Sometimes there is an associated hip weakness or hip tightness on the same side which allows the leg to internally rotate too much during activity which places stress on the knee and results in patello-femoral pain. Your physiotherapist will also check your hip biomechanics and mobilise the hip if required and give you appropriate strengthening exercises to improve your general biomechanics. Why not make an appointment at our local Duncraig physiotherapy practice?